Italian architect Aldo Rossi (1931–97) is a crucial figure in twentieth-century architecture, his work highly influential in both theory and practice. Working in Italy and throughout Europe after World War II, he disputed the then-dominant credos of the modernists—and even went so far as to question the very status of his profession. Discarding utopian pretenses, his work claimed the autonomy of architecture with formal restraint. 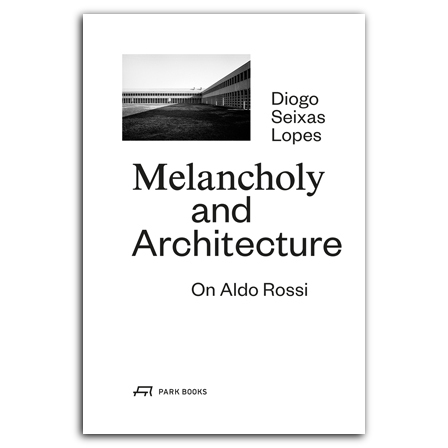 In Melancholy and Architecture, Diogo Seixas Lopes looks at Rossi’s work through the lens of a term often used to describe it: melancholy. While the influence of melancholy on literature and the visual arts has been extensively studied, its presence in architecture has been largely overlooked. Exploring Rossi’s entire career, Lopes traces out the oscillation between enthusiasm and disenchantment that marks Rossi’s work. Through a close exploration of one of Rossi’s landmark creations, the Cemetery of San Cataldo in Modena, he shows how this brilliant, innovative architect reinterpreted a typology of the past to help us come to terms with representations of death and the deep sadness that inevitably accompanies it. Beautifully illustrated, Melancholy and Architecture both illuminates the career of a key postwar architect and offers a new perspective on the long cultural history of melancholy. (1972–2016) was a partner at Barbas Lopes Architects in Lisbon and visiting professor at both the Faculdade de Ciências e Tecnologia da Universidade de Coimbra, Portugal, and Carleton University, Ottawa.